Back in June I talked a little about the importance of clever packaging for handmade products looking to expand into the retail shop market and outlined all the basics I have learnt, from experience, that are required and expected for packaging. Today I thought I would expand on that sharing some of the packaging I have seen, that is handmade but professional and perfect to fit the retail market. Hopefully I can help inspire all of you handmade creators who are considering wholesale, consignment and gallery work where you may, at times, be expected to have professional looking packaging included with your products. 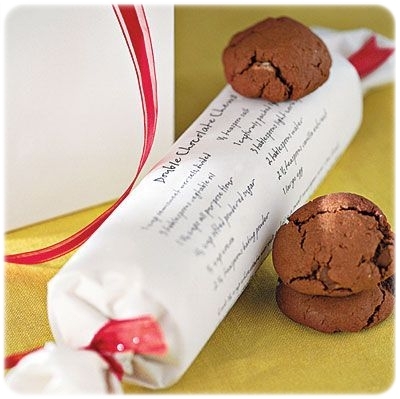 Love this idea for cookie and food packaging. Of course, you probably won't want to give away the recipe if you are selling through retail outlets, after all, you want your customers to keep coming back for more. Maybe instead of the recipes, you could use the story of your product or business and how it came about. Not only is it appealing to look at, it gives your customers a background story so they can connect with you as the maker. Soap, bath and beauty products can be one of the easiest to package using handmade materials that can be made to look very professional. Whether you go with a simple printed wrap around card for square soaps or handmade your own printed labels for jars and containers. There are lots of ideas out there to from the simplicity of adding a button to your packaging to creating a product whose shape is reminiscent of a slice of cake. Get inspired you and add your own little touch to personalise your handmade bath and beauty products. 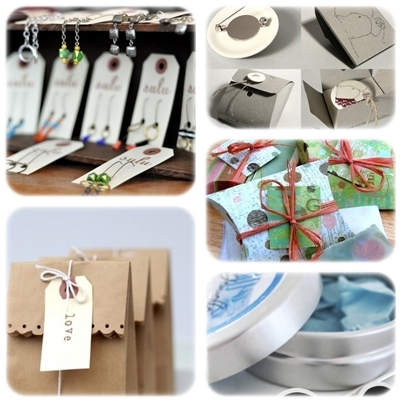 Of course, considering I make jewellery I could not go past sharing some of the ideas I have seen for packaging jewellery and similar small objects. The hand illustrated box in this group is especially lovely and the perfect addition the hand drawn illustration on the broach enclosed. From tins, like mine which are great for postage to protect your work, which allow you to print my own sticker labels to DIY Pillow boxes that you can print on your own customised card, colour scheme or even add your own logos. I especially love the idea of using everyday items found in any stationary store like the little tags that make a great display for hanging earrings or the simplicity of brown paper bags given a little touch of class. I hope the above inspire you to create your own beautiful and unusual packaging. 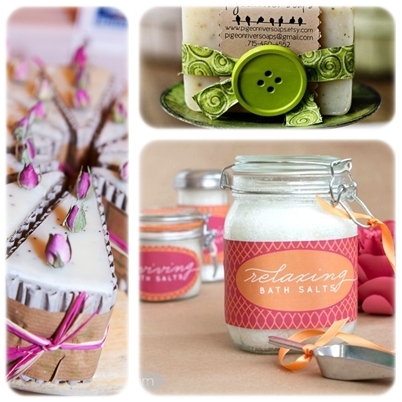 Visit my PInterest board for more ideas or share you own packaging by becoming a contributor.